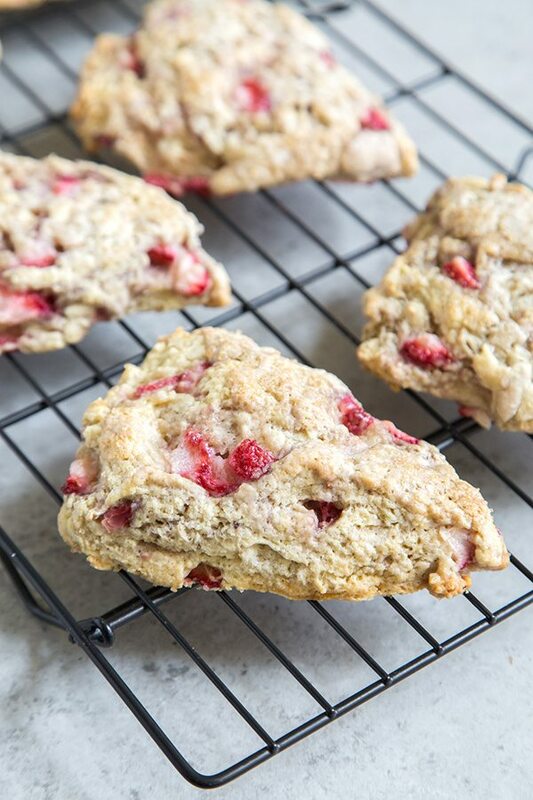 Tender, slightly sweet, and perfect with a cup of coffee, these Strawberry Buttermilk Scones are sure to become a family favorite. Memorial Day is around the corner and summer will be here before you know it! I love this time of year in Southern California. 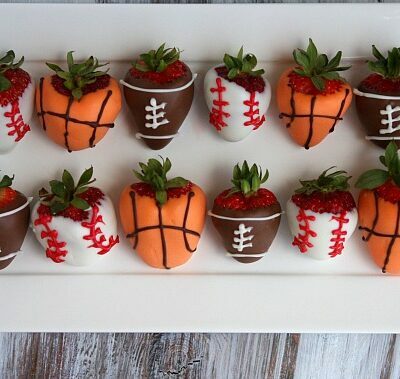 It’s strawberry season! 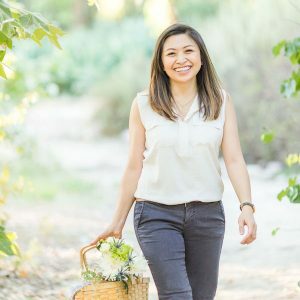 From the Strawberry Festival in Oxnard to the abundance of strawberries at farmers’ markets and roadside stands, I can’t get enough strawberries. 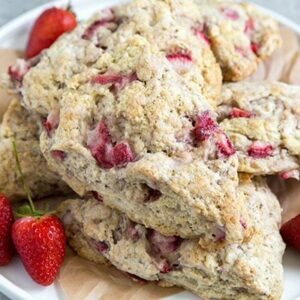 Strawberry buttermilk scones are an easy and delicious way to take advantage of sweet fresh strawberries. Scones are made in the same fashion as biscuits and pie dough. 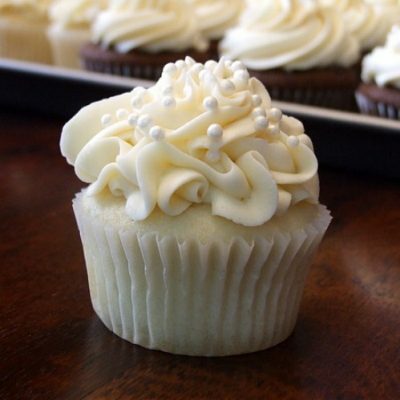 Very cold butter is cut into the flour mixture and the dough comes together with the help of heavy cream. 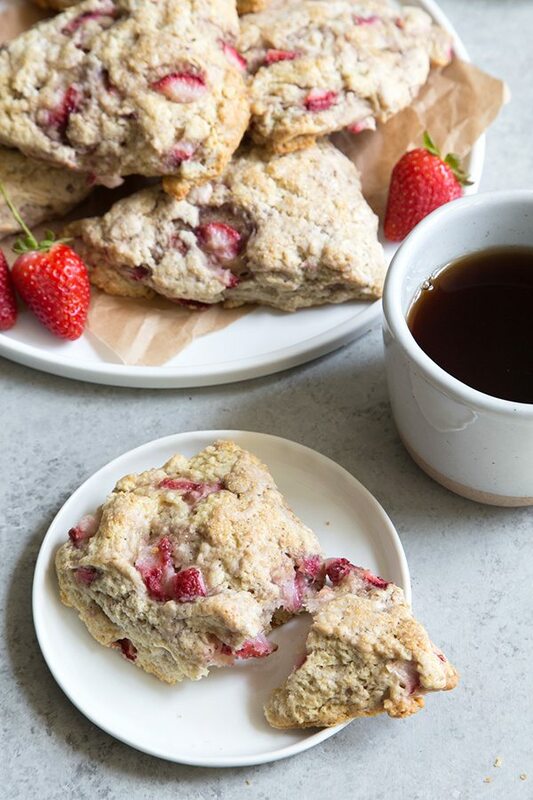 These scones are a little lighter than the average scone. Instead of heavy cream, we’re using buttermilk. 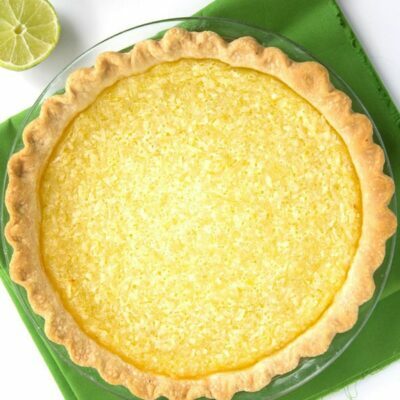 Buttermilk is wonderful in baked goods with fruit. 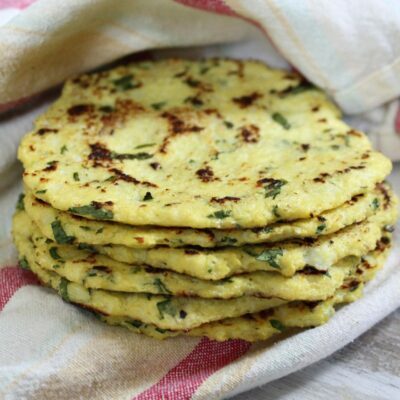 There’s something about the tang of buttermilk that helps to enhance the sweetness of fruits. 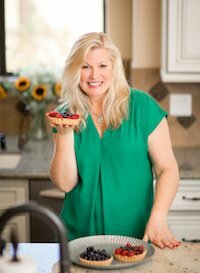 It’s best to use fresh strawberries for this recipe. Frozen strawberries will expel too much moisture, creating undesirable results. These scones are simply topped with a sprinkling of turbinado sugar. Feel free to use your favorite glaze, if desired. Preheat oven to 400°F. Line a baking sheet with parchment paper or silicone mat and set aside. Add the cold butter. 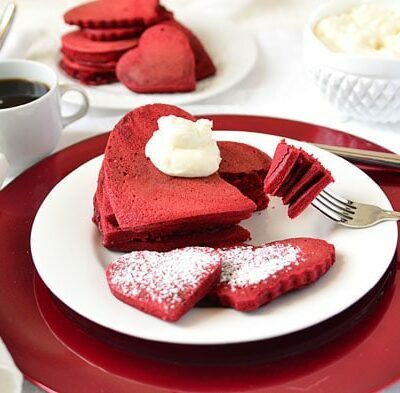 Cut into the flour mixture using a pastry blender, two forks, or your fingers until mixture resembles coarse sand. In a small bowl, whisk together the egg and buttermilk. Pour into the dry mixture. Fold to combine. Midway through mixing, add the diced strawberries. Continue to fold until the strawberries are evenly distributed and the dough is mixed together. Transfer the dough to a lightly floured surface. Pat the dough into a circle with a thickness of about 1-inch. Slice into 8 wedges. Place the scones onto the prepared baking sheet, allowing at least 2 inch distance between scones. Lightly brush the top of each scone with heavy cream and sprinkle with turbinado sugar. Bake for 20 to 25 minutes, until the scones have puffed up and the tops are lightly golden brown. Let the scones cool slightly on baking sheet before transferring to a wire rack. Serve warm or at room temperature. Store leftover scones in the fridge in an airtight container. Re-heat in a toaster oven. I just made these today. Not only do they look great, they taste great. They were fantastic, the whole family loved them. 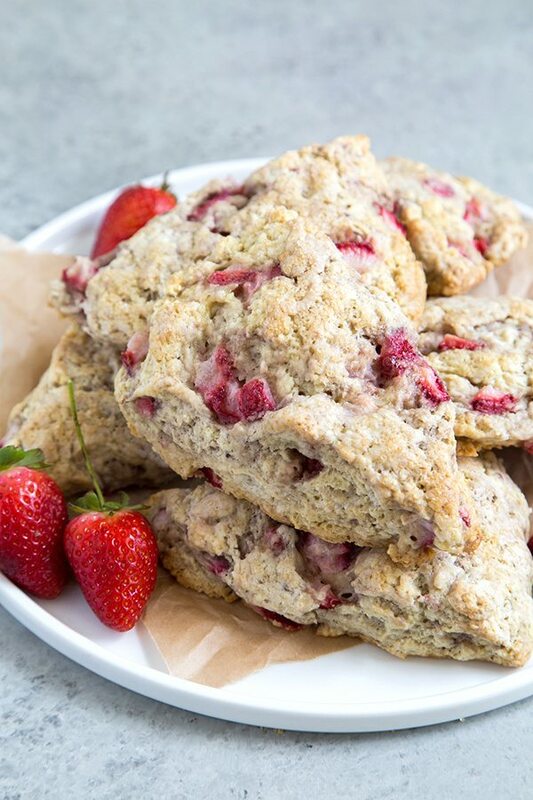 Not too sweet, good strawberry flavor and not dry like other scones. The only bad thing was we weren’t able to find a local store selling clotted cream to have with them. 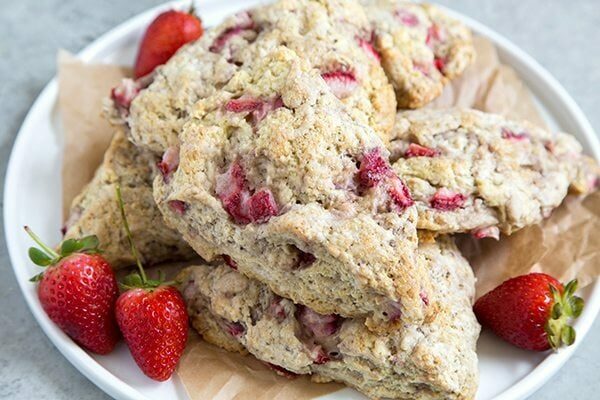 These scones look delicious with the fresh strawberries. I do love a good scone straight out of the oven, still warm and yummy. I’ll have to try these. These scones look great! Strawberry season is the best! Here in Pennsylvania, we can get them in the winter, but they just don’t taste the same as they do when they’re in season. 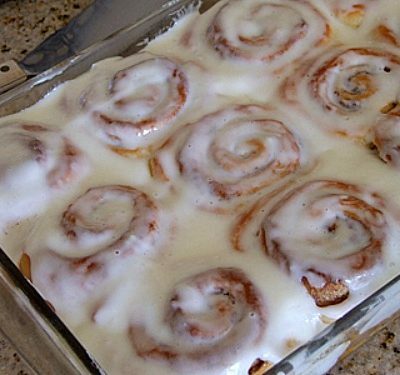 This time of year, they are much sweeter and flavorful.